Is this a Merch course? Do I need a Merch account to make t-shirts? Merch by Amazon is one of the most exciting Print on Demand platforms right now because your shirts are immediately visible to Amazon's customers. There is a waiting list for Merch. If you don't currently have an account, it's a great idea to get signed up for the list right now at merch.amazon.com. Be aware that it can take several months to get approved. If you've been waiting for a while, you might want to try reapplying. Because Merch is so popular, this course includes walkthroughs of the platform, however if you don't have a Merch account or have lost your Merch account, that's ok. The real value of this class is the focus on creative skills you can apply to all kinds of platforms - RedBubble, Zazzle, Amazon Custom and so on. Where's your big screenshots? How much can I expect to make? Merch is very much a 'reap what you sow' platform. We've found it's possible (but not necessarily typical) to make $150 to $200 a week with 50 simple designs, but obviously the more designs you create and the better your designs are, the more sales you can expect to see. It is also very seasonal - if you create a shirt for a particularly timely topic, you can have a very successful week. The good news is that as it costs you nothing to make your own designs, the sky is really the limit! Merch has a 'tier' system so you start with the ability to upload up to 10 shirts. 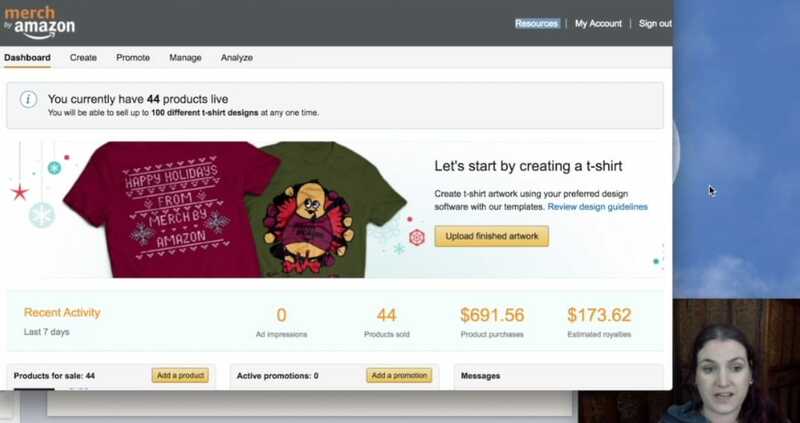 As you get sales, you are automatically tiered up to add more and more shirts so it is very scalable. You can of course add your designs to other platforms like RedBubble for bonus income! I tend to get a lot of international sales there. We've been selling successfully on Merch for the last year. Please check out the testimonials and successes of our students which hopefully speak for us as teachers. What software do you guys recommend? Personally, I find Canva unbeatable as a design tool (no affiliation). It comes with a huge range of free elements that they have ok'd for use in t-shirts. It is also straightforward and simple to use. I prefer Canva for Work [$9.95/$12.95 a month] because it has the option of transparent backgrounds, uploading your own fonts and more elements. I use Canva in tandem with ResizeImage.net to make images the right size for Merch. Isaac uses Adobe Photoshop and Illustrator for designs. Creative Cloud subscription starts at $9.99 per month. Teachers and homeschoolers may qualify for Adobe's steep educational discounts. For t-shirt reseach, we recommend our own software, Tangent. Tangent handles niche-finding, keyword suggestion, image recognition (for copycat detection, sourcing, keywords, color suggestions etc. etc. ), artwork sourcing and much more! Tangent also includes the Tangent Explorer which is an all in one Chrome extension. Enter a keyword and quickly check which t-shirts are selling with that keyword on Merch (and other popular sites), check trademark status, generate jokes, source artwork and much more with a simple click. Do you recommend outsourcing work to designers? We think it can be very empowering (and cheap!) to design your own shirts and in this course, we show methods for generating a large number of designs quickly all by yourself even if you have zero artistic talent. However, we know everyone works differently and we all have different preferred tasks. If you're just looking to buy ready-made designs, you probably don't need a course! Just grab Tangent and run the designs through the image recognition to get keywords. Another option is to come up with the topics and concepts for a shirt yourself and outsource them to designers to create. This process is something we can definitely help you with!